Western blot analysis of extracts from HeLa and Jurkat cells, untreated or treated with Staurosporine #9953 (1 μM, 3 hr) or etoposide (25 μM, overnight), using Cleaved Caspase-9 (Asp330) (D2D4) Rabbit mAb (upper) or total Caspase-9 Antibody (Human Specific) #9502 (lower). Cleaved Caspase-9 (Asp330) (D2D4) Rabbit mAb recognizes endogenous levels of caspase-9 protein only when cleaved at Asp330. 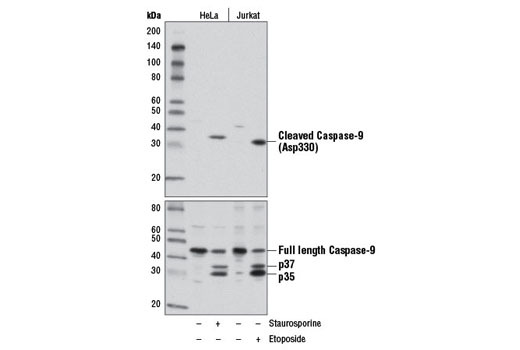 Full-length caspase-9 may be weakly detected with some cell lines. Duan, H. et al. (1996) J. Biol. Chem. 271, 16720-16724. Srinivasula, S. M. et al. (1996) J. Biol. Chem. 271, 27099-27106. Liu, X. et al. (1996) Cell 86, 147-157. Li, P. et al. (1997) Cell 91, 479-489. Zou, H. et al. (1999) J. Biol. Chem. 274, 11549-11556.